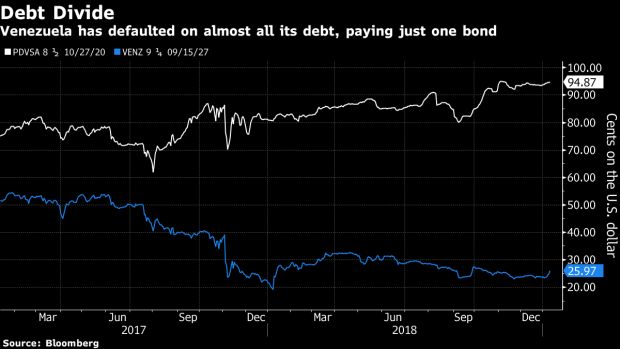 (Bloomberg) -- Creditors holding defaulted debt issued by Venezuela and its state-run oil company sent an envoy to Caracas for talks with the government’s legal advisers, according to two people familiar with the matter. A small U.S. delegation from a group of bondholders advised by Cleary Gottlieb Steen & Hamilton and Guggenheim Securities met with lawyers from Dentons, the firm representing Venezuela, and local creditors to discuss options for getting paid back after the nation defaulted on some $9 billion in debt payments, said the people, who asked not to be identified because the information was private. The group includes large investors such as T. Rowe Price Group Inc. and Fidelity Investments. Among the topics on the table: a possible deal that would involve a so-called value recovery instrument in which bond investors could get compensated through royalties paid to operate oilfields in the nation. Another scenario under discussion was an accord under which creditors would help finance Petroleos de Venezuela’s oil drilling ventures with U.S. companies such as Erepla Services LLC in return for a chunk of the revenue. A representative of the bondholder group declined to comment, as did officials at PDVSA and the oil ministry. It’s a long-shot that the bondholders’ efforts will result in any near-term resolution, absent a political transition in Caracas. Sanctions prevent U.S. investors and banks from participating in a traditional debt restructuring with Venezuela, and Erepla would need a license to work in the country from the Treasury Department’s Office of Foreign Assets Control. A revenue-sharing deal may also meet resistance within Venezuela, where much of the population has long been leery of handing over control of the oil industry to foreigners. Venezuelan officials have expressed interest in working out some kind of deal, provided that creditors agree to future financing for the cash-starved state oil company, according to one of the people. That also would require an exemption from OFAC, as sanctions introduced after Nicolas Maduro’s election in May prohibit U.S. citizens from being involved in the sale or transfer of equity interest in an entity owned at least 50 percent by the government. It’s unlikely that the Trump administration would give a waiver. “Anything that makes life easier for Maduro is a non-starter,” said Francisco Rodriguez, the chief economist at Torino Capital in New York.